Many family historians and genealogists have accessed HeritageQuest Online remotely using their local library card. 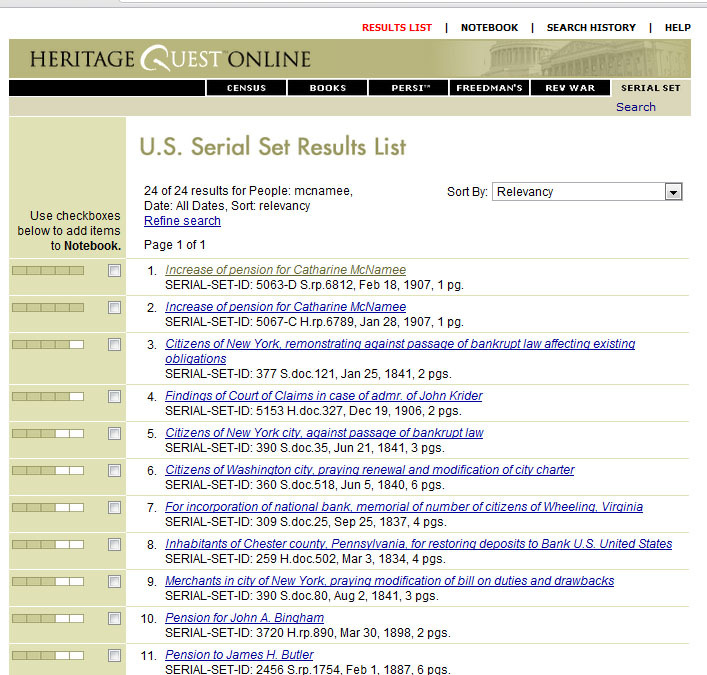 Most go directly to the census files and fail to explore the U.S. Congressional Serial Set collection. If you haven’t tried HeritageQuest Online yet, check with your local library to see if they have a subscription to this popular Genealogy research tool. 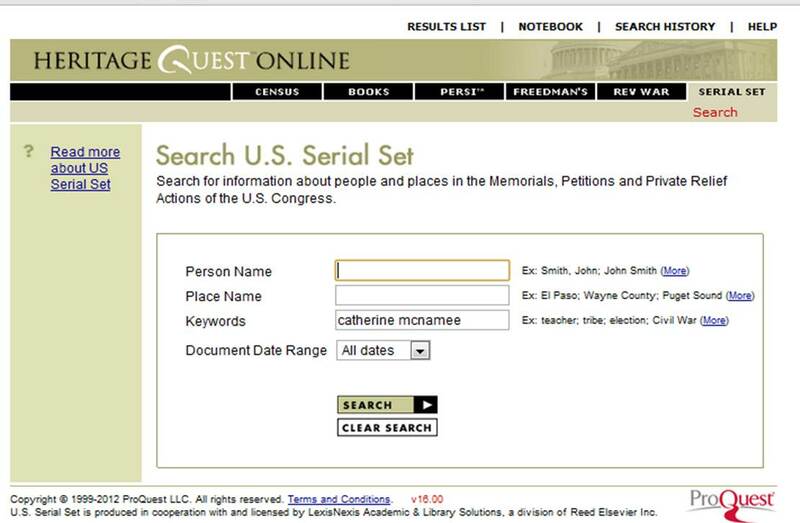 In addition to various Census Records, Heritage Quest Online offers digitized books that are searchable by people, place or publication, PERSI, the Periodical Source Index, digitized Freedman’s Bank records, Revolutionary War collection and the US Serial Set. 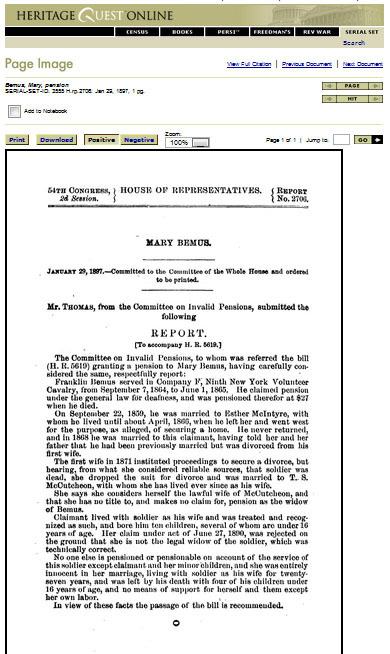 Although each hold great interest to the family researcher, let’s review the U.S. Congressional Serial Set, digitized by LexisNexis and provided to the family researcher online. What is the US Serial Set? 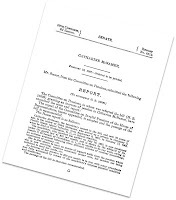 The 15th Congress, 1817 – 1819 under James Monroe, began the publication of the United States Congressional Serial Set which contains House and Senate Document and Senate Reports. The bound books of the Serial Set were assigned a unique serial number, thus the name. 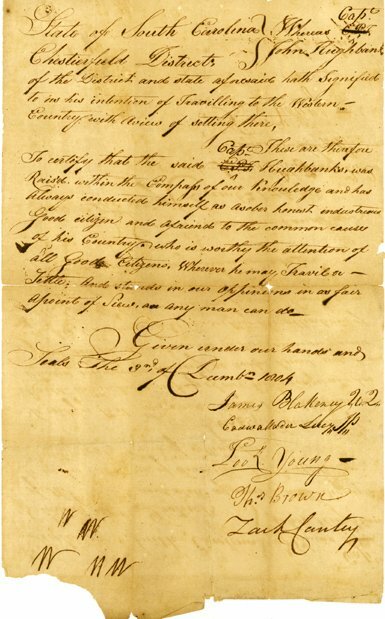 The collection includes Private Relief Actions, Memorials and Petitions which have genealogical interests. These topics have been abstracted and digitized on HeritageQuest Online (Proquest) and Readex of Newsbank databases for online search queries. (Note: You will want to do a name and place search on both of these abstracted collections, as they might offer different finds). Prior to 1817 the 1st – 14th US Congress (1789-1815) activities, records and documents may be found amongst the 39 published volumes of the American State Papers. 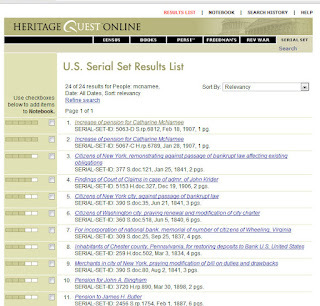 A National Archives overview of the U.S. Congressional Serial Set, penned by Jeffery Hartley in 2009, Using the Congressional Serial Set for Genealogical Research tells us that the reports and documents cover topics on “women, African Americans, Native Americans, students, soldiers, sailors, pensioners, landowners and inventors.” Luckily for us, both HeritageQuest Online (ProQuest) and Readex of NewsBank have abstracted and digitized text-searchable articles of genealogical interests and provided them to us online. 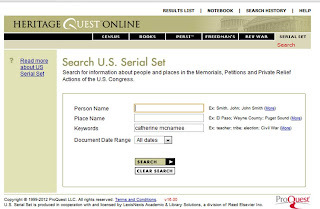 HeritageQuest Online (ProQuest) collection includes documents from 1789 to 1969. The Readex Collection includes the Congressional Serial Set of 1817-1994 (103rd Congress). As these reports may be private in nature and mention your ancestor by name, or have a ruling or account of your ancestor’s activities, the family researcher will surely want to scour the collection using name, place and keyword searches. 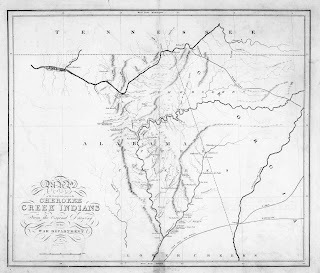 Bounty land and other land claims may assist the genealogists in understanding why an ancestor was granted or denied land. The private land claim records and documents between 1789 to WWII are extensive; over 500,000 were brought before congress during these years. Researchers may also find law suits that name their ancestors. I often see soldier, widows, pensioners, named, especially for the Civil War era, but there is a large collection of Revolutionary War reports also, some detailed by the Daughters of the American Revolution. 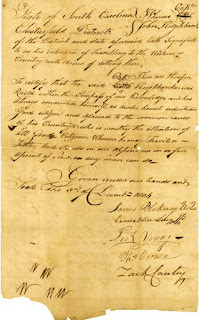 Private relief petitions and claims offer historical information on our ancestor as well. An interesting find may be of a divorced woman in search for financial assistance. Details of the divorce are often given. Another great find may be locating your ancestor as a federal employee between 1883-1863. These records may provide residence, work assignment and pay. Army and Navy registers from 1848 to the early 1860’s are also available and often include death information. 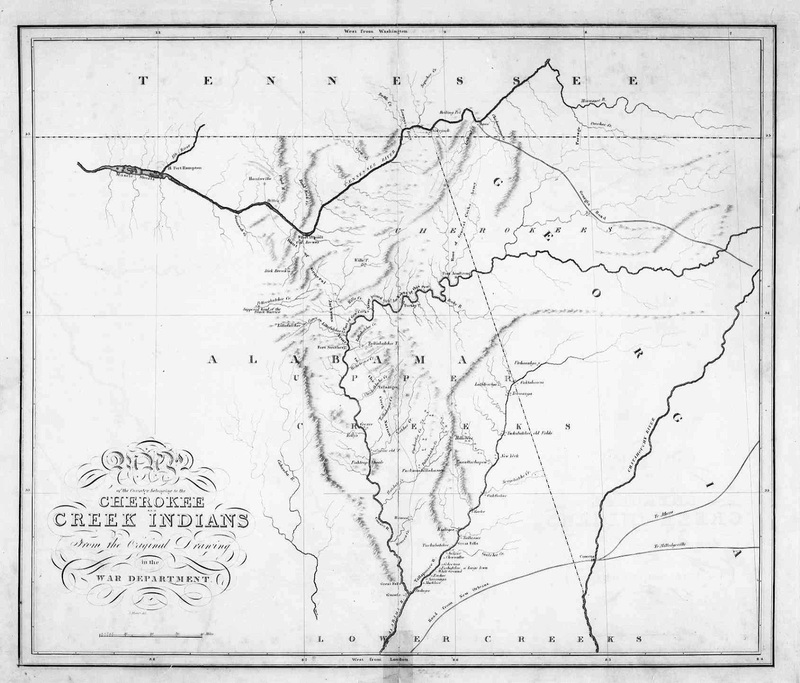 Other findings may include land surveys, western explorations and expansions and railroad papers and a plethora of maps. Untapped Resources: Private Claims and Private Legislation in the Records of the U.S.Congress, Schamel, Charles E.
I thought I should document this story for it impresses upon us the importance of thorough research, and encourages us not to be hasty in our conclusions. I attempted to recall this story today in a seminar, and thought it best to record it accurately. Will The Real WHC Stand? As an early researcher I was led to Camp Butler cemetery by Civil War records. So when the intials WHC appeared on a tombstone at the gravesite I thought my questions were answered. Here among all the tombstones, we thought, was the burial place of Wiley Harvey Charles (W.H.C.) But yet on the tombstone, it also states “unknown”. What was unknown? It was this clue that led a further search. Perhaps W.H.C. was not our Wiley. The best explanation thus far is WHC stood for William Henry Chase Whiting (1824-1865). Whiting was captured at the Battle of Fort Fisher with the rest of the Fort defenders and transferred to the Officers Prisoner of War Camp: Governor’s Island, where he died of dysentery. 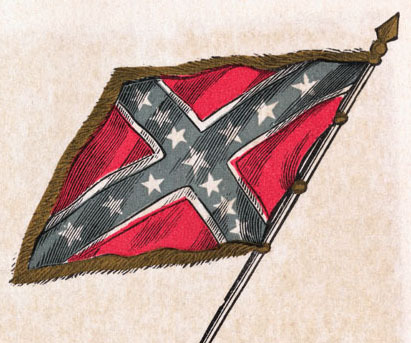 Much can be found at the United Daughters of the Confederacy website. Like many civil war vets his wife had his body exhumed and reinterred. Whiting’s final resting place was at the Oakdale Cemetery in Wilmington, NC. Major General WHC Whiting was captured at Fort Fisher and died at Governor’s Island, in New York March, 1865 (his obituary states). Many of his men were also captured or killed and their tombstones gave tribute to their Confederate service to WHC’s army. The story of Whiting, William Henry Chase can be found at the Texas State Historical Society. Galvanized Yankees were prisoners of war who in exchange for their freedom traded their gray uniforms for blue. But WHC Whiting left the Unites States Army (West Point Grad), resigned from the Army Corps of Engineers, and picked up the rebel flag in the Confederate States Army. After a closer study of confederate tombstones, a repeat of WHC popped up everywhere: in cemeteries, in civil war books, in birth records, etc. There’s Wiley Harvey Charles, also a confederate soldier who went by WHC, and many who named their sons after WHC followed by the family name. Just google WHC +confederate or +civil war and be amazed at the number of people named WHC. Another twist to this story is that the Fort Fisher captured defenders who were not injured were imprisoned at Elmira (POW camp) in New York. And, the wounded captured Confederate soldiers were taken to Point Lookout Maryland POW camp upon recovery. 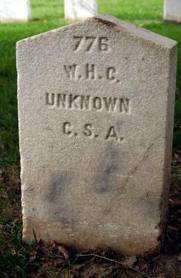 So why was this WHC tombstone at Camp Butler in Illinois? Well, maybe, I don’t have my ancestor’s exact tombstone after all. What I have probably located is an unidentified soldier who served under Whiting or (perhaps?) one of the unidentified soldiers captured with him or killed on the battlefield. For more information reference the National Archives Publication M598: Selected Records of the War Department Relating to Confederate Prisoners of War, 1861–1865; Department Collection of Confederate Records, Record Group 109; National Archives, Washington, D.C. This collection has been digitized on ancestry.com. 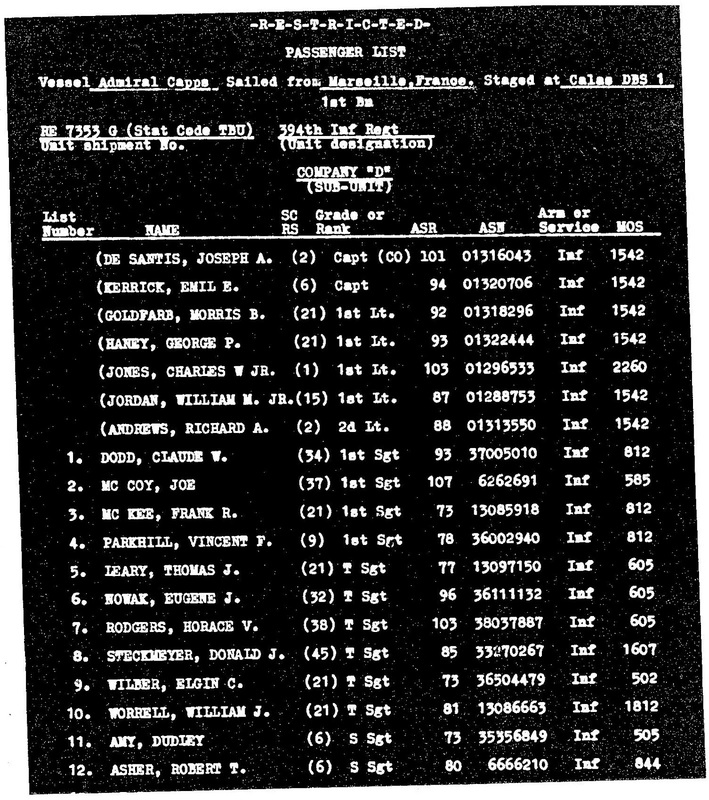 When all else fails, and you don’t have enough information in military records to clearly define with which unit or company your WWII ancestor served overseas, you may be able to follow ship records by dates to narrow possible troops/regiments. 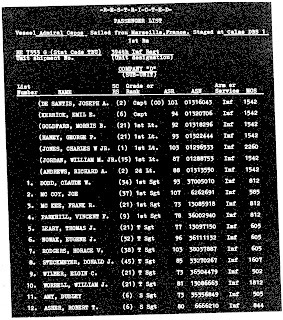 According to our records, in 1951 the Department of the Army destroyed all passenger lists, manifests, logs of vessels and troop movement files of the United States Army Transports for World War II. Once you have narrowed your troop by date of departure/arrival, then Morning Report searches of those candidates are necessary. No, it will not be easy and fast, but it may be possible to locate your soldier by name (hidden roster, medical attention, transfers, etc.) and even have a glimpse of daily activity in Europe through troop reports. Your ancestor may have served with various companies, troops, and organizations throughout the war, with no mention by name or service number in Morning Reports. Once soldiers reached overseas they may have been assigned to a new troop. To select from Speaker Series, visit 2012 Offerings for Corporations, Genealogists and Schools. 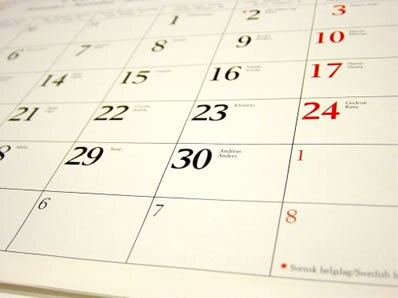 Note: Private presentations are only added to the calendar at the request of the customer.